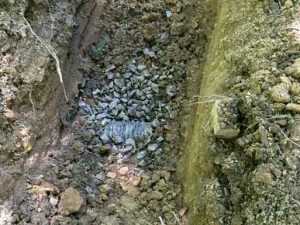 What is a field line repair? A mechanical field line repair does not require a county permit and consists of repairing the existing system. This may be an option in some cases. We look over your situation, assess the possibilities and give you the options. The following is a recent job and the steps explaining what happens if a repair can be done. We received a call requesting a quote for a field line repair or replacement. 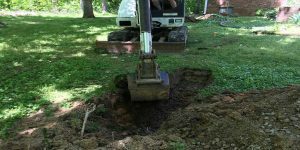 The septic tank had been pumped the week before and since then it had become obvious the septic system was not working properly. The caller was comparing quotes from local septic companies. Allgood went out to take a look and submit a quote. After assessing the situation, they felt a total replacement was not needed and that a mechanical repair would take care of the issue. 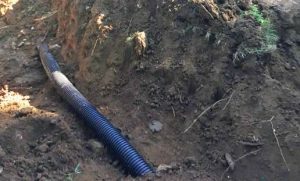 The home owner was incredibly relieved at the prospect of saving thousands of dollars but confused as every other company had quoted a full replacement of the drain field (field lines). So they called the county inspector. His opinion was a total replacement was not needed and that a mechanical repair would work in this situation. 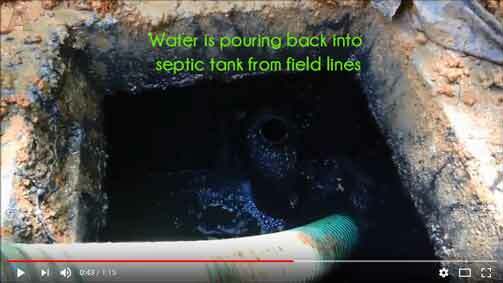 After pumping the tank, the ditch was dug to allow a new line to be laid down between the back of the septic tank to the field lines that were functioning properly. Yard is probed to locate field lines and then the mini-x digs down to find the actual line. If the septic tank was recently pumped, we will still check the water level. If it’s high we’ll pump it down to remove access liquid. Next step is to find the back of the septic tank and dig down to find the pipe that runs out of the tank into the drain field. The yard is probed to locate the field lines. Once the general area is determined, it’s time to dig down and find the actual line. Field lines can go bad for many reasons, often there are tree roots, which was this case. So once the dry field line was found the trench was dug from the line to the septic tank. A new pipe was laid down and the two were connected and the ditch was filled in. New line is installed and then is buried.